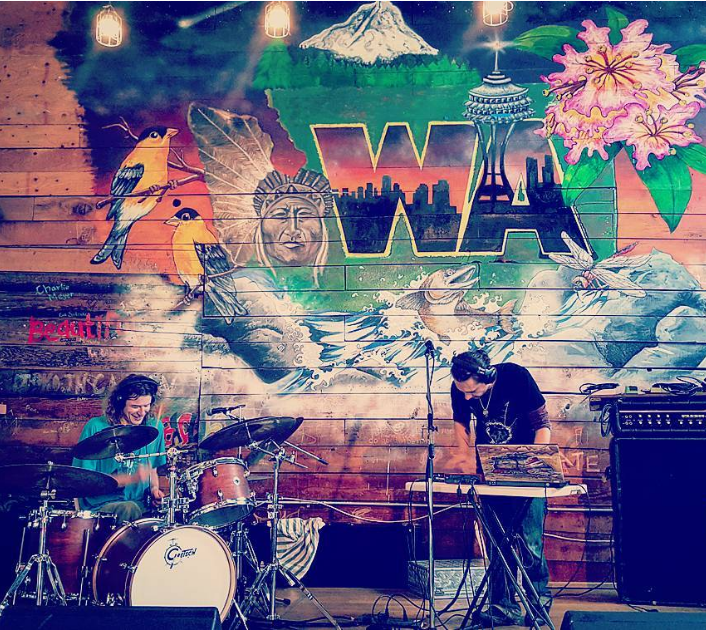 (1) Djime is an experimental electronic duo from Seattle, WA" and specializes in creating music for moving bodies and minds. In the fall of 2017, Djime recorded a series of live sessions for their first full-length album release entitled "Octopus Dreams". (2) Djime began as a solo project in which James was experimenting heavily with recorded loops & samples to perform live with a laptop & midi controller. One evening while practicing some new music at a local Seattle open mic James met Ian who was there to perform his own solo material. Their mutual interest in weird and alternative music is what lead them to get together soon after that for songwriting sessions and ultimately began working together as a duo in January 2016 with Ian playing drums. (3) Djime draws their style from swelling guitar builds, high energy synthesizer leads, deep driving bass, thickly layered distortions, mangled drum machine percussion, and live breakbeat jazz drumming. (4) In support of the new album, Djime has also just released a music video on youtube for a track called "Untitled @190 v2.1". The video is an abstract mesh of contrast and pulsing intensity that accompany Djime's already striking music, like falling into a mind's eye that conjures a digital octopus dream. 5. What would you like to say to your fans & the world? (5) The message of their new album and video is to celebrate being weird and thinking differently, being an independent mind, and being open to what the universe has to say.